See the Lookout Point Lake website for additional information. Primary recreational opportunities are listed below. Directions: From Eugene, 22 miles southeast on OR 58. Factoid: 22 miles southeast of Eugene, Lookout Point Lake is a popular recreation area offering year-round fishing, seasonal water skiing, sailing, swimming, picnicking and hunting. The area is also managed for wildlife habitat such as waterfowl, blacktail deer, upland game birds, wintering elk, bald eagles, osprey and many other species. Lookout Point Dam an earth-and-gravel-fill dam with a concrete gated spillway. 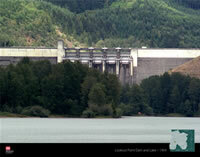 The dam was completed in 1954 and provides flood control and has three generators, which produce 40,000 kilowatts. * Bike trails upgraded with help from International Mountain Bicycling Association (IMBA). Visit www.imba.com for more information.